Recently we used Business Centred Delivery to build and design a custom CRM and workflow tool to help transform the service based company, Hire Plants. Hire Plants are an industry leading business providing high quality plants for long or short term hire. They service a range of organisations from businesses to film shoots and functions. Within the business there are four teams. With different teams playing key parts in the business, Hire Plants wanted to move away from a paper based information system to an entirely digital solution to increase the efficiency and visibility of account and project management, quoting, delivery, and servicing. Moving to a digital system also enables deeper strategic insight through analysis of the captured information. They came to us with this request to design and build a digital solution to innovate their business. It was important that before any work began, we understood what each of their business goals were, the different areas of the business they impacted, and how a digital product and/or feature could be integrated into the business to achieve these goals. This resulted in the development of a custom web-based CRM and end-to-end workflow tool capable of running on desktops, laptops, tablets and mobile devices. 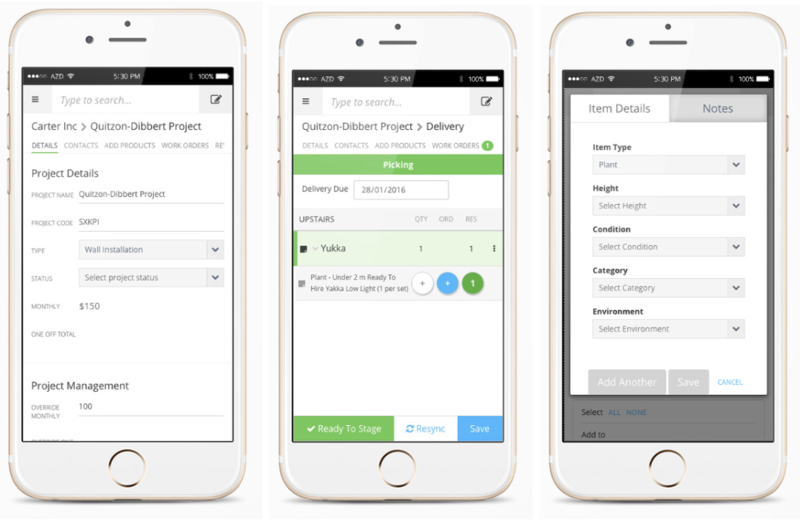 The custom CRM site we built is a mobile first application that functions like an app when viewed on mobile and tablet devices. At the same time, it looks and behaves like a web app on desktop computers. The solutions we included in this web-based application included Customer Management, Account Management, Project Management, Quote Management, Job Processing, and Scheduling. This system was designed to automate, empower, and streamline the internal processes and management of the business and is being used today to increase visibility and efficiency, reduce manual processing and errors, and drive down costs, while improving the experience of staff and customers alike.